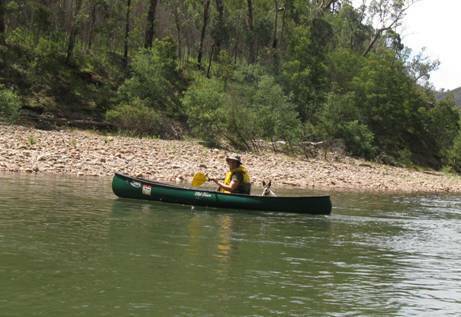 We spent yesterday (5 ½ hours) white water canoeing on the Macalister River in our new ‘Old Town Pack Angler’ canoes which worked wonderfully. What was not so wonderful was that our JR, Tiny fell out of Della’s canoe unnoticed on an entertaining 1 metre drop. When we stopped a couple of km further on to portage a dangerous Grade 3 rapid we noticed she was missing and had to paddle/hike back to look for her. After 2 hours and 1km vertically up and down we finally found her and could resume our journey. Understandably this morning we are all quite tired. There is a new river height gauge at Licola. Yesterday it was 1.73 which made for quite good conditions (probably about .85 -.9 on the old gauge. I would say the river is canoeable from about 1.68 to 1.8 after which it would become much more entertaining. Warning: There are a number of trees stuck in rapids, particularly the Grade 3 rapid just below the Burgoyne’s Track crossing which definitely need portaging (on the right). 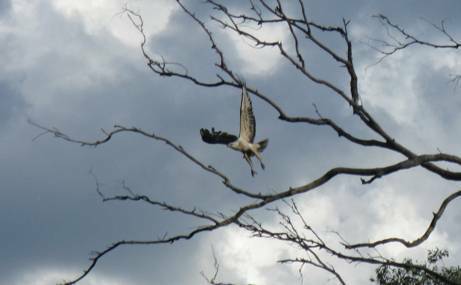 Have been canoeing the Macalister River for over twenty years – and there have always been fish eagles like this guy (see below). Magnificent creature, feasting on the many introduced carp, redfin and trout to be found in the river – and without which he (and his mate – off somewhere nesting I suspect) would not be there.